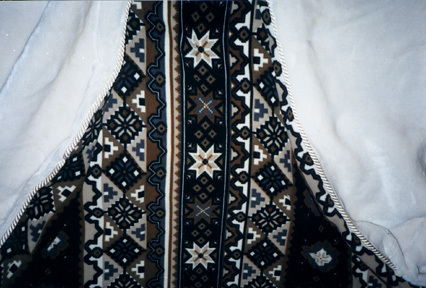 This page shows photos across three columns and has more details about the lap robe designs. 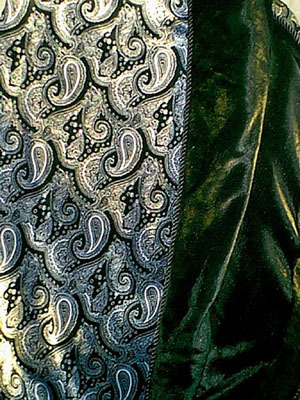 This lap robe has the traditional Paisley shapes in white on a field of soft, black velvet. On the back is a striped black on black faux fur. 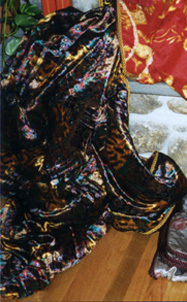 Medieval carved panels are evoked by the Cloisters lap robe's velvet print. 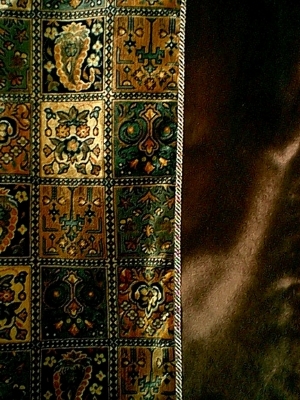 Some panels have Paisley figures, several are floral, some have geometric shapes, all in warm tones of brown and gold with black. 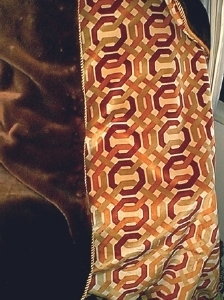 The other side is lined with soft brown faux fur. The braided cord is two-toned gold. The Crayons lap robe will brighten your room. Bright, bold colors on a black background are combined with a black faux fur lining. Kaleidoscope has a strikingly colorful montage of design elements on iridescent velvet: disks and quatrefoils evoking stained glass; squares of red, green and gold plaid; and patches of tiger fur print. The other side is the softest brown faux sheared beaver fur. On a field of beige velvet, Octagons of gold, pale orange and Indian red are interlocked. Brown faux sheared beaver fur lines the other side. 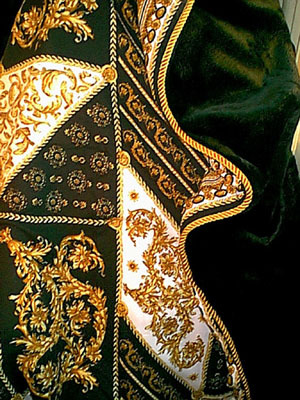 Florentine's beautiful filagrees in gold, black and white evoke the beautiful center of Renaissance art. A soft black faux fur lines the lap robe. Snow white faux fur lines the Alaska lap robe. 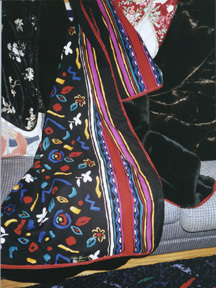 The print on the front evokes Native American blanket designs. 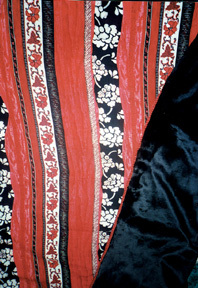 This is the Tassels lap robe. 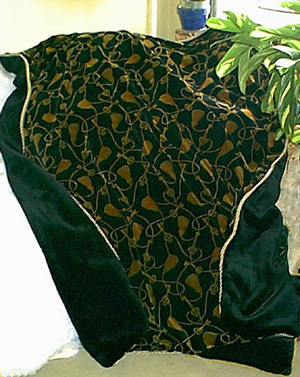 On a field of soft, black velvet, an all-over pattern of gold tassels holding keys is featured. 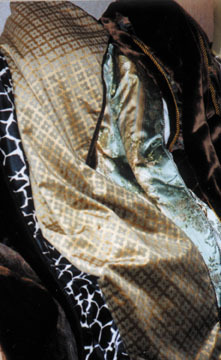 The lap robe is lined with black faux fur and bound with a gold braided cord. Avignon has a field of gold cotton velvet with an all-over pattern of raised silver gray quatrefoils. It is lined with soft, medium brown faux sheared beaver fur. The Parthenon lap robe in bright red, white and black features designs reminiscent of classical Greek decorative painting. It is lined with soft, black faux fur. Click on the links to return to the Catalog Pages or click a new selection at the top.